Help & DocumentationCreating ContentCreating Basic Metrics and Reports Basic MetricsHow are Moving Average and Standard Deviation calculated in MI? How are Moving Average and Standard Deviation calculated in MI? The Moving Average and Standard Deviation always are calculated using trailing; i.e., historical) data. The period that is used for the calculation is determined by the Alert Prior Measurement Value Count setting in the Measurement Interval Editor as shown above. EXAMPLE: The Moving Average for the data point on 8/1 would be based on the 30 days from 7/3 to 8/1, inclusive. The Moving Average for 8/1 would be based on the 30 days from 7/2 to 7/31, inclusive. NOTE: We shift the Standard Deviation calculation back by one day so that sudden fluctuations can be compared against a stable historical data set. This is to avoid comparing a big fluctuation against a data set that includes the big fluctuation itself! Сurrent data point is excluded from the moving average calculation. Prev: When is data recollected for Aggregate Metrics? 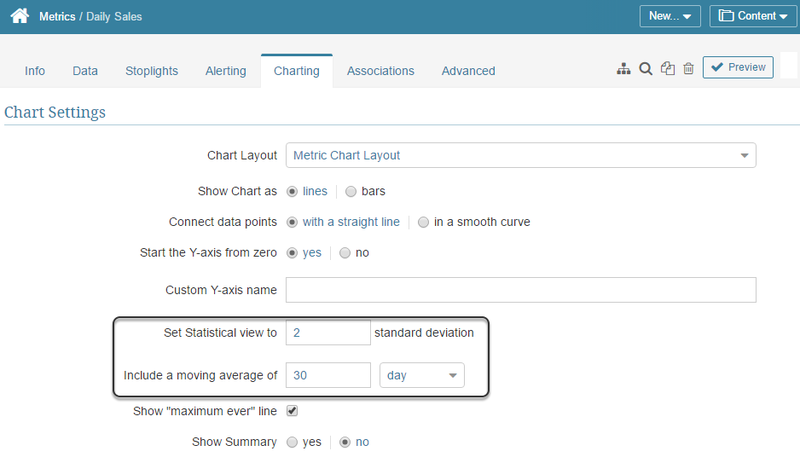 Next: When is it necessary to "Update Live Chart/Report" to see changes made on the Element Editor?